Salutations! First off, apologies for the lack of posts over the last week. I had a week of Annual Leave and that disrupted my normal routine, including posting whilst I grab my morning brew. Back-to-work today so the posts are back too. I did grab some more Geek Bits which will - over time - filter into these posts. I'm starting a new cover gallery this morning (The EAGLE and MARVEL COMIC will both continue). I've always been a big SCOOBY DOO fan (and the sense of disappointment when Scrappy arrived was a defining moment in my childhood) so I was understandably chuffed when a new comic - SCOOBY DOO AND HIS T.V. FRIENDS - arrived in early 1982. And from Marvel UK as well. 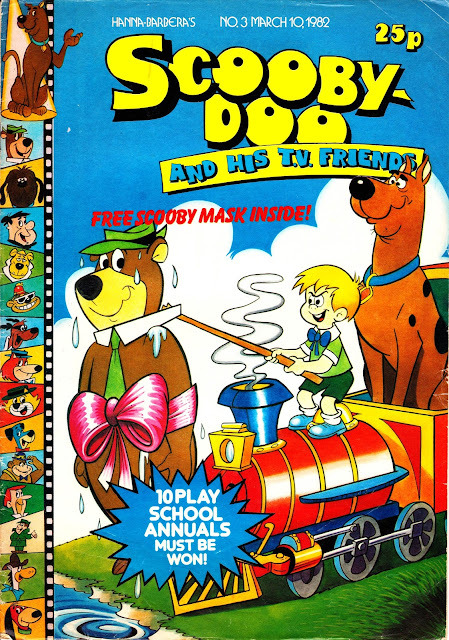 My knowledge of the background to this is fairly limited but - as I understand it - this was nothing to do with Marvel's short-lived line of US Hanna-Barbera comics (although I'm pretty certain it included material from those hard-to-find books) which was already defunct (in painful circumstances) by the time this weekly launched. I think this was an entirely separate licensing deal between the animation studio and Marvel UK, giving them reprint rights to the accumulated back-catalogue of strips based on H-B material, including the material created during Marvel's license. Not only is this based on one of my favourite animated shows, it also (in my opinion) marked another (low key) turning point in the history of Marvel UK. They'd dabbled in licensed properties as far back as the (short-lived) first volume of THE SAVAGE SWORD OF CONAN and had more success with its successors (PLANET OF THE APES, STAR WARS, DOCTOR WHO etc) but this was the first time that marvel had used a licensed property to launch a weekly pitched at a younger - non superhero - readership. 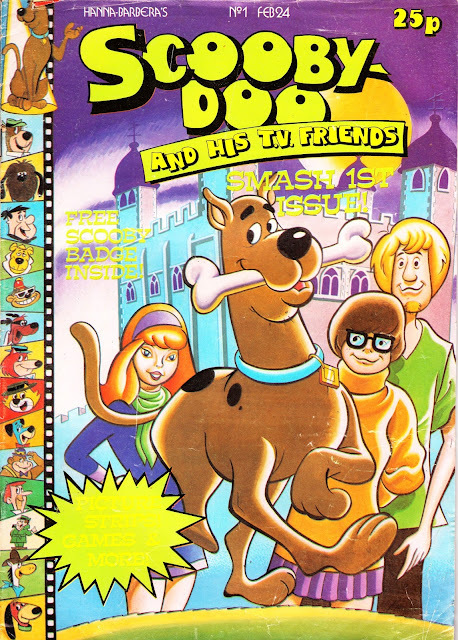 The success of Scooby pointed the way to the weekly incarnation of WORZIL GUMMIDGE and onto titles like THE GET ALONG GANG, CARE BEARS, ACORN GREEN and a new revenue stream for the Annex of Ideas as the boys adventure market withered throughout the eighties. 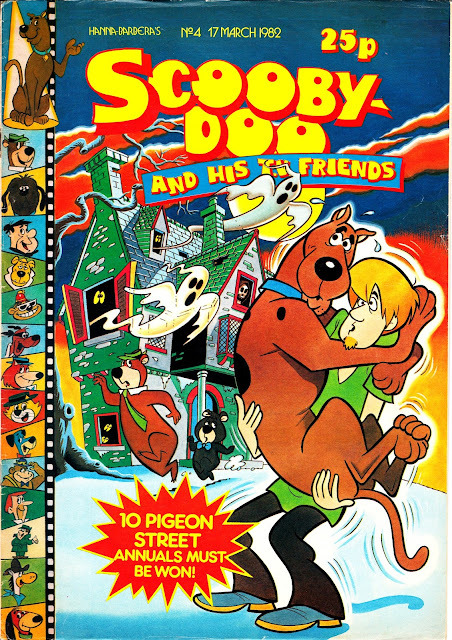 As the title suggests, Scooby may have been the principal draw (publication probably coincided with another run of the show on the BBC although I couldn't swear to that) but most of the H-B animated menagerie appeared somewhere at some point. Although the uncredited strips were probably pulled from a variety of sources, some of the other features (simple text stories, activity pages and - possibly - the covers) were - I'd guess - especially prepared for M-UK in London. 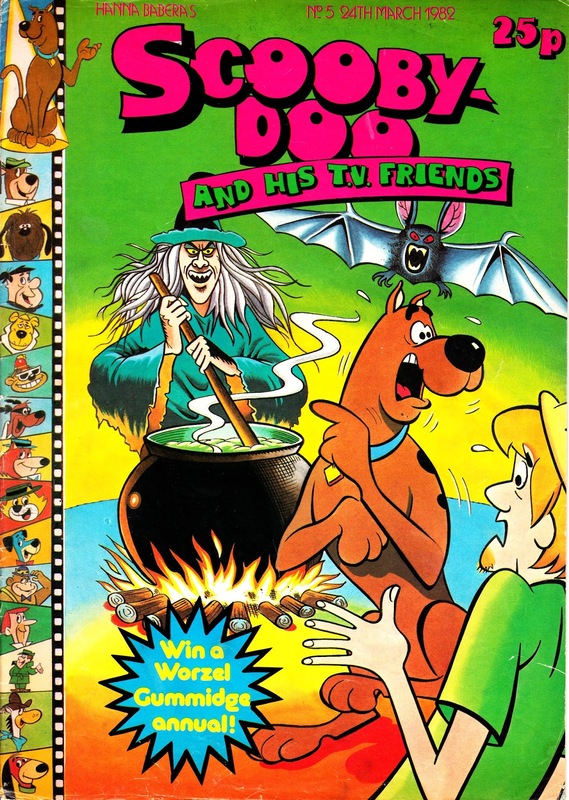 There was also a single-page Scrappy Doo strip which - I think - was created in the UK and may have been M-UK's contractual obligation to enhancing the overall H-B library of material available to all rights holders. As will become obvious, I don't have a full run of issues so there will be gaps. However, as this is an aspect of M-UK's history which isn't generally well covered elsewhere, I though it was worth posting what I have.